Anyone can grill chicken, but you’ll wow your friends and impress their mothers if you whip up this uber-easy variation on grilled chicken. Yogurt works overtime to leave the chicken tenders unbelievably tender, while the other ingredients in the marinade give the chicken unforgettable flavor. Serve as an appetizer or an entree. Place skewers in a bowl or pan filled with water. Soak for 10-15 minutes. Remove from water and pat dry. Combine yogurt, garlic, ginger, cilantro and soy sauce in a large bowl. Stir to incorporate. Add chicken tenders, cover, and refrigerate for 15 minutes. Remove chicken tenders from marinade and gently push one chicken tender each skewer as pictured. Heat grill or grill pan over high heat. Brush lightly with oil. 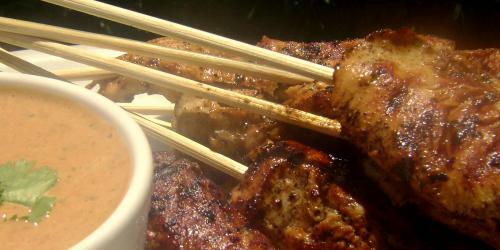 Grill skewers, working in batches for 3-4 minutes on each side or until fully cooked. Look foward to making this recipe next weekend! Thanks Gabi! I made your satay and peanut sauce recipes – followed them to the letter and wouldn’t change a THING. All of us are rubbing our bellies in contentment. I served it with a light carrot raisin salad and grilled pita. Thanks! Look foward to making this recipe next weekend!